If you want to find out everything there is to know about Desenex Antifungal Spray Powder, then this is the review for you. Desenex Antifungal Spray Powder claims to effectively stop the spread of various fungal infections, which affect the feet, such as ringworm (tinea corporis) and athlete’s foot (tinea pedis). It also eliminates the nasty symptoms associated with these infections, such as the sensation of burning, rashes, skin irritation or cracking and general discomfort. If you’re interested in Desenex Antifungal Spray Powder’s ingredients, price and guarantee, then you should continue reading this review. Monazole Nitrate is an anti-fungal compound is among the most effective and renowned anti-fungal agents used in medical science today. This is proven by its place on the World Health Organisation’s list of essential medicines. It works in an identical manner as all other modern anti-fungal substances, by inhibiting the production of a key component of fungal cell membranes. The inclusion of aloe vera helps to decrease the sensation of burning around the infected areas as well as helping to treat the rashes and irritation. The usage of the listed propellants may be a source of side effects since there is a wide range of people who suffer allergic reactions when coming in contact with them. As is the case with all other anti-fungal products, the usage instructions for Desenex Antifungal Spray Powder are easy to follow. The target area should be washed and dried thoroughly before application. Once this is done, apply a thin layer of the powder to the skin and massage it in. This process should be repeated at least twice per day (each morning and each evening), for four consecutive weeks. If the infection persists, seek medical consultation. The presence of certain ingredients may cause various allergic reactions. The ingredients in question are the propellants and the Aluminum Starch Octenylsuccinate. Users who are allergic to these substances may experience side effects such as skin irritation, rashes and burning. Ironically, these symptoms are the same ones that the product claims to cure. It is also advisable not to treat children younger than two years of age with this product, unless directed to do so by a doctor. Be careful to keep this product away from your face. A 4 oz. can of Desenex Antifungal Spray Powder costs $10.22 if purchased from Amazon and this price also includes the shipping fee. There are no special offers or coupons available. Unfortunately there is no universal guarantee policy in place, since distribution is handled through authorized re-sellers. This should be a warning to customers that the product may not be effective. The user reviews on Amazon are generally positive, however there are a few dissenting opinions. Desenex Antifungal Spray Powder is an effective product with powerful active ingredients and a convenient method of use, however the high price, risk of side effects and the lack of a guarantee urge caution and prevent us from recommending it. 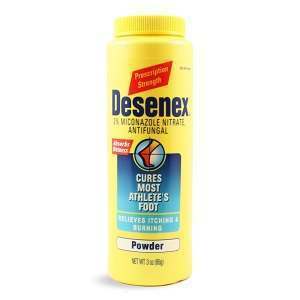 Jimmy Rodriguez	reviewed Desenex Antifungal Spray Powder	on June 10th	 and gave it a rating of 2.5.